Cono Sur never ceases to amaze and delight. Wine-wise and price-wise. While Chile is home base, so many of their wines come with an elegant, French feeling. This Chardonnay combines the nervy, mineral notes of Chablis, with the solid, fleashy feeling of south Burgundy. 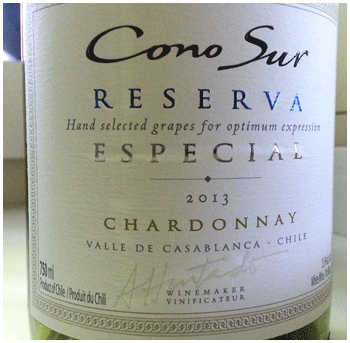 The Casablanca Valley is one of Chile’s ‘cool climates’ accounting for this wine’s refreshing edge. Amazing wine – so exciting for everyday drinking, but also good enough for a Millionaire’s party. Honest. You’ve really hit it out of the park with this recommendation, Billy: smooth as silk and very refreshing. The Duchess and I aren’t millionaires so we did the next best thing: we broke out the Monopoly and got down to business. Before the bottle was half done, I’d secured Park Place and Boardwalk and built hotels on both. With one good pour remaining, I pushed her into bankruptcy, she went to bed early, and I savoured my victory–and the last glass! Roddy, always said Cono Sur can make you feel like a millionaire. You got it. Congrats! Thanks for your story.